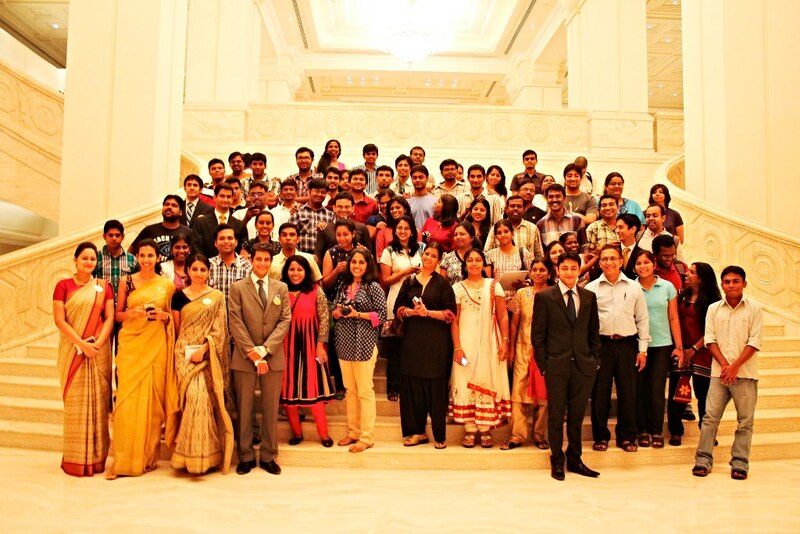 Grandiose of the ITC Grand Chola & the Madness of Poonam Pandyas!!! 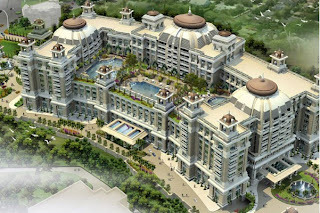 Well, there are quite a few 5 star hotels here in Chennai with Park, Leela Palace, Hyatt Regency to name a few. Being a brand new arrival to the city, here comes a review of ITC Grand Chola! First thing that comes to your mind - in the midst of the several high rise buildings and metro rail, a totally unique structure, irrelevant to the rest of the location. But still so unique and so beautiful like how the Taj Hotel is in Mumbai in the midst of other modern structures. As soon as you enter, errr.... right now I'm talking about the western entrance. As such the building in general, is facing north. And has 4 entrances on all 4 sides - why??? There's a story behind the whole thing... And that starts with the name - Chola, named after the renowned, brave royalty of Tamil Nadu. They had built several several temples, all across Tamil Nadu, the main ones being Brahadeeswara Temple, Gangai Konda Cholapuram, Dharasuram and Thirubuvanam. The Chola contributions explored by me include Madambakkam Temple, Trichy Kadambar Koil, Pettavaithalai Temple, Karur Pasupathiswarar Temple, Mayanur, Chidambaram Nataraja Temple, most of the temples in Pudukottai, Dhusi mamandur etc. No, this is not an exhaustive list!!! Back to the ITC Grand Chola, the entire architechture, interiors were all done taking inspirations from the main 4 Chola temples noted earlier. It starts with the entrance. Most temples have its main entrance in the west, coz the Lord inside faces East, an auspicious direction, as sun rises there. The hotel too has the main entrance at west. Again most temples have entrances on all 4 sides, so does this hotel. All temples, are extremely well decorated with sculptures and reliefs, so is the hotel with iconography taken from the main 4 Chola temples. How extensive is that - well, sculpting is not even spared at the mezzanine wall and the verticals of the staircase!!! Even the chandeliers don't look too western, it has a eastern touch to it. But what came to my mind was, why didn't they use Chola Bronzes inspired chandeliers taking design ideas from Paavai Vilakku, Adukku Dhiparathanai etc instead of the regular glass ones (suggestion 1)???!!!!! Over to the awesomeness of the hotel... its wifi everywhere. Ok, that's silly, that now almost all hotels have that. But here, its ok if you don't have a device. The guests are provided with a ipad to use within their room!!! Now that's called awesome, isn't it... And what does that ipad do? Its better to ask what that ipad doesn't do... It can be used to control all lights, fans, AC, and even door. It can be used to check who's outside your room. It can be used for house keeping and room service and the list goes on & on!!! Its an LEED Platinum certified hotel, meaning its an eco-friendly hotel that produces its own requirement of electricity with wind and solar energy. Eco friendly - great! What about CSR? Wouldn't it be great if their staff wore Kanchi silk sarees or Madurai Sungudi Sarees helping their revival and survival, like how Taj Mumbai has taken up on Banarasi silk (suggestion 2)???!!! I did spot 2 life sized Dokra Installations (Brass artwork of Orissa & Madhya Pradesh) in the 2nd floor, some Bidriware showpieces (Silver inlay-work of Karnataka) in restaurants and some modern art paintings hung up on walls. Then why no Chola Bronzes and Chola frescoes inspired paintings (suggestion 3)??? The food.... Awesome food. So far I've had 4 buffet lunches and quite a few snacks and coffees at this hotel (the 4 days long Art Event outfit posts going on right now at Fashion Panache blog happened in this venue!). Gluttony at this best!!! Well, all were events so my food was buffet always, none a sit-down meal! The variety of food was too much! The best part - the variety in the veggie section was also a lot. Wherever I go to the section, it would always be few north Indian veggie and south Indian veggie varieties. For a change, here continental and mediteranian vegetarian was also served. Its been long since I wanted to taste veg lasagna and here I did! Further more impressive - eggless desserts available for sure.. However just on one day I got to taste their eggless cake. Why eggless cakes not always available in buffet (suggestion 4)??? Its many inhouse restaurants incl. Madras Pavilion (for buffet), Cafe Mercara Express, Nutmeg (Gourmet shop), Peshawari (north Indian & Mughalai), I Place (Pub), Tranquebar, Ottimo - Cucina Italiana, The Pan Asian, Royal Vega, Cheroot (Cigar Lounge). There's a fabulous spacious car, bike parking. They might be giving car chauffeur service to park the guests cars, I'm not aware. But a bit disheartened that bikers (like me!) are left alone. There's no entrance to the hotel directly from the bike parking!!! A small walk exposed to sun and rain, leads from bike parking to the hotel entrance - why (suggestion 5)??? To put in a nutshell about the grandiose of the hotel - A person from Galway, Ireland told me this hotel more grandeur than the hotel near his place where US President Barack Obama stayed on his visit to Ireland. That should suffice, when I say about the grandeur of this hotel! 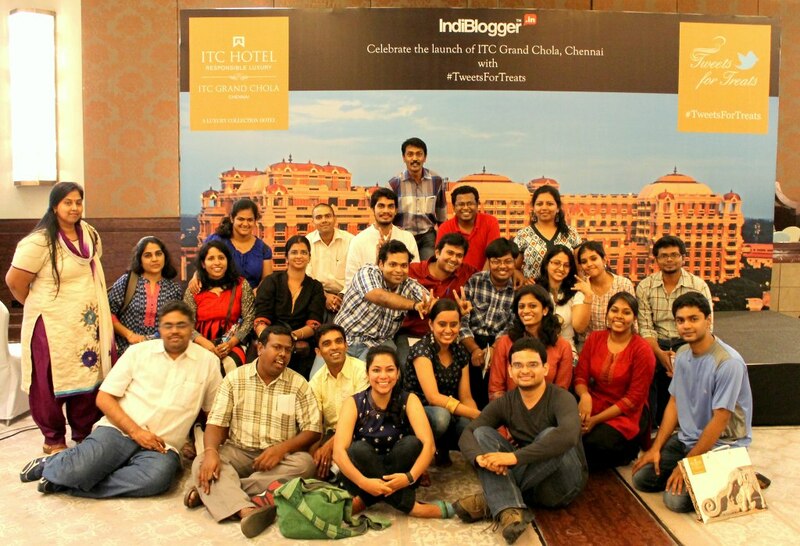 Well, this last visit was for a meeting of Indiblogger and that calls for a ton of other events and one of it was to develop a story in the hotel's setting, in teams, while we were taking the tour of the hotel on twitter!!! Ours was titled Poonam Pandya (Pandya kingdom were rivals of Chola kingdom!). In simple words, it was sheer madness!!! Honestly, none of us knew how the story was going, till it got over. Lolz!!! 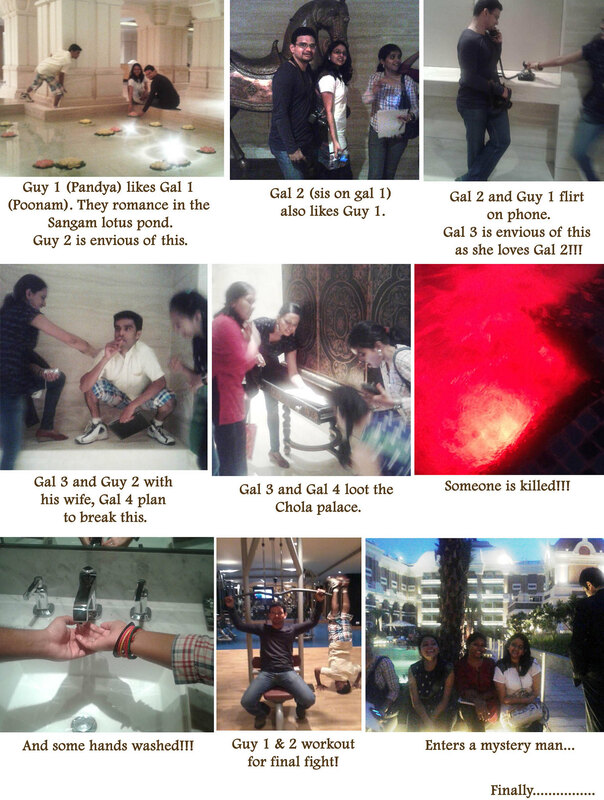 Here's our story shortened in few pics... Its okay if you don't understand, neither did we. But the craziness won us the prize!!! Lolz!!! click the image to enlarge & read the story. 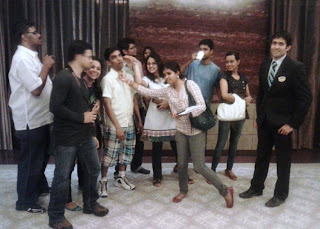 P.S.1: Click here to know what I wore to the Indiblogger meet. 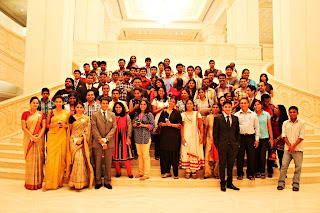 P.S.2: Photo 1 from ITC Grand Chola website; Photos 2-12 by me; Photos in the story by Kalyan, Clement & Krishna. 2nd last pic again by Kalyan. Last pic by Indiblogger!!! P.S: I was invited to the hotel for review purpose, as a part of the Indiblogger bloggers meet, however the opinions are my own and this post does not to advertise the product/service.